Ships in 1-2 weeks. Free shipping! Get creative with the ultra-flexible Lounge Around Daybed by Umage. 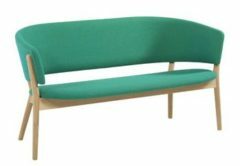 This Danish-Designed daybed is idea for adding some casual seating to your space. Design your own look by adding accessories, such as a table, light or side pocket. You can even flip over the seat cushions to instantly create a surface for setting down your drink! The Lounge Around Sofa includes a base and four cushions that can be moved around. Holes are provided for adding “built-in” tables, lighting and other accessories. Brass plugs are provided to fill empty holes to create a finished look. The solid American oak wood frame is available in a natural finish or a darker brown stained finish. Cushions are covered in a durable, contract grade dark grey fabric made of woven polyester. Optional accessories include a small, round side table (14″ diameter) in the oak or dark oak finishes. To add an attached light, select the Light Around in white or black to add to your sofa. Then, choose any Umage pendant light shade to hang from the Light Around. Lastly, a Side Pocket adds a handy compartment on the end of the sofa for storing remotes, charging cords or anything else you don’t want to lose. This items requires some assembly.